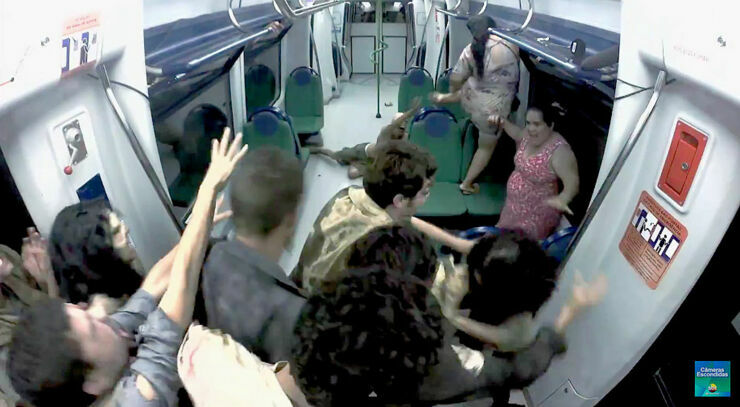 Get ready for an incredible Brazilian zombie train prank that sees the un-dead hordes descend on a metro train and attack terrified passengers in Brazil. 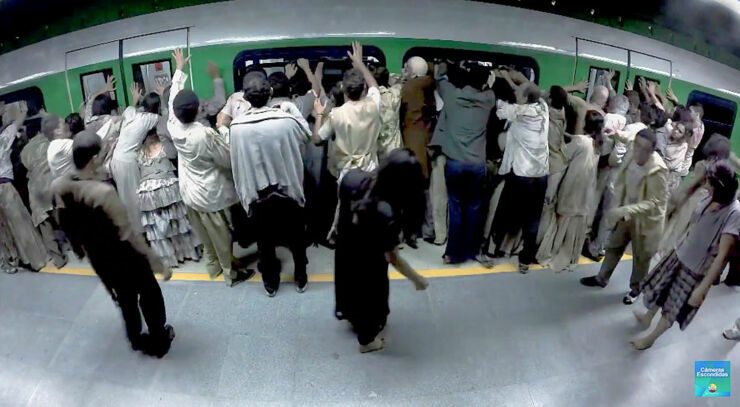 It's quite possibly the best zombie prank ever pulled as you witness the walking dead pranksters managing to force themselves onto the carriage of a subway train while it waits on a station platform late at night. The flickering lights and the failure of the doors to open add to the tension. 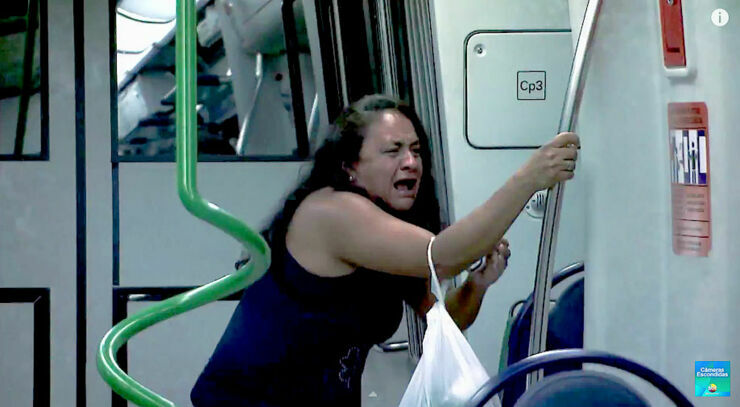 This Brazilian zombie train prank is like something straight out of a horror film and pulls no punches when it comes to screams. We've all heard of 'Snakes on a Plane', but what about 'Zombies on a Train'? If you happen to be a female traveling alone on the subway at night in Brazil after watching this then i would be afraid. Very afraid. You are likely to be molested by people who are not after you for your looks, but more for your brains. And pretty much whatever else they can sink their teeth into. 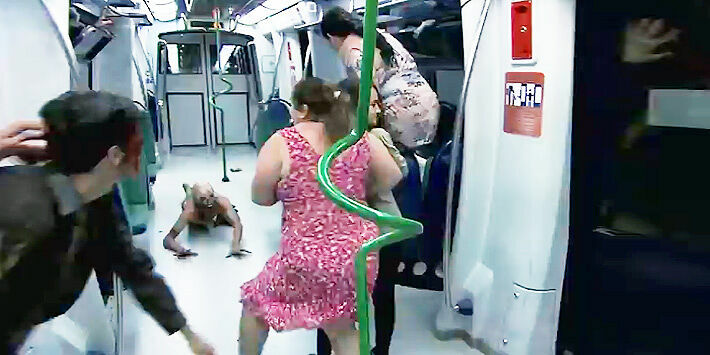 You have to admit, the zombie train prank is executed to absolute perfection as the hoards force their way into the train carriage to grab an evening snack from these poor unsuspecting women and by their reactions they are completely terrified. But what they don't know (how cruel is that) is it's all part of an amazing prank for popular show on a Brazilian TV network 'SBT' which is a big hit with audiences in South America and are known for pulling stuff like this (remember the 'Coffin in an Elevator' prank a while back?). 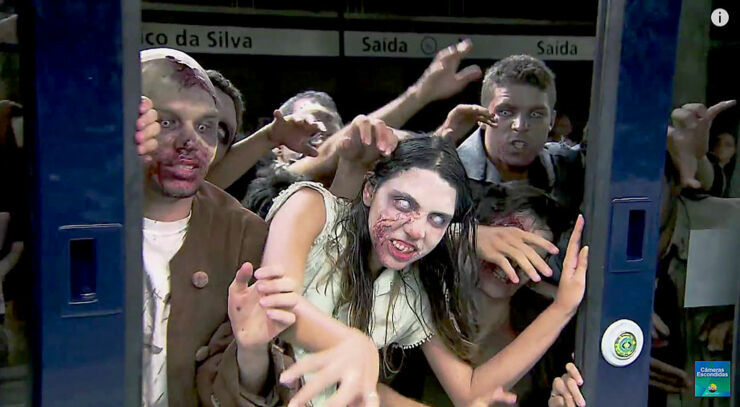 The build-up to the Brazilian zombie train prank is expertly done as the train pulls into a station, flashing lights, a train conductor begging for help over the loudspeakers, a sense of 'something is not right' and then zombies appearing outside the train, trying to board the carriage. It's perfect TV theater and makes for compelling viewing, mostly because you know it's not real, but more a feeling of relief that you are not one of the victims. How they got permission from the public transport network to do this is beyond belief, but the results are truly epic and look (at least from the poor passengers perspective) totally genuine, it has to be one of the most elaborate and f#cked up zombie prank ever undertaken. It even looks as if one poor lady passed out from fright. 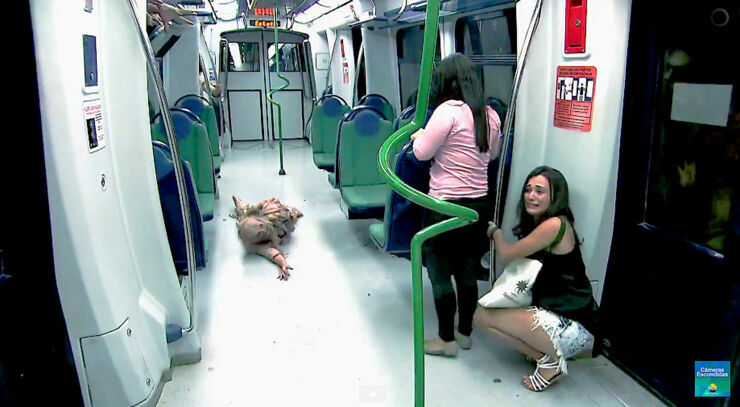 I can guarantee that after watching this zombie train prank you'll never travel home alone on public transport, leave the safety of your house, or watch videos like this on the internet again. Long may this continue. It stuff like this that makes the The Walking Dead look like a kid's show.